Kigali Moms and Dads is hosting another fun event this weekend at the Akilah Cafe! 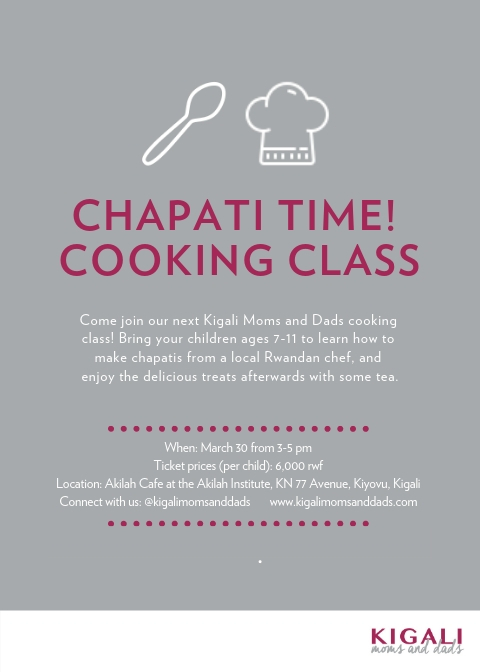 Bring your children to learn how to make chapatis from a local Rwandan chef, and enjoy their delicious self-made chapatis with tea afterwards! Located at Akilah Cafe at KN 77 Ave, Kiyovu, Kigali. Please email shannon@akilahinstitute.org to RSVP. We hope to see you there!